If we're going to make excuses for the Knicks when they lose games they shouldn't — They were tired! They're still figuring each other out! Deron Williams was really mad! — the least we can do is give the Atlanta Hawks the benefit of the doubt. They came into the Garden last night: (a) wrapping up an endless and difficult five-game road trip; (b) were missing Joe Johnson and Al Horford, their two best players; (c) dealing with various insurrections and grouchiness, particularly from Tracy McGrady, of all freaking people. They weren't exactly showing off their best face, is what we're saying. 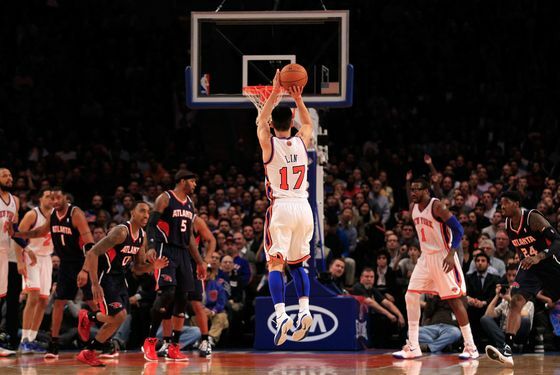 So don't get too excited by the Knicks' 99–82 wipeout of the Hawks. But feel free to get a little excited. The Knicks got a chance to coast last night — excellent timing, considering the nationally televised game in Miami tonight — thanks to a blistering, nearly perfect first half. They led 60–35 at the break and eventually led by as much as 30 points. The best part about this is that they amassed the lead in the platonic ideal of how the Knicks should amass a lead like that: spreading the points around, scoring off turnovers, and playing stifling defense that it's still difficult to imagine the Knicks playing. The Hawks made a ton of turnovers and the Knicks capitalized repeatedly; this was a pleasant evening if you like fast breaks. Particularly if you like fast breaks between these two. It was all nice and simple and relaxing. (It was also thrilling — lots of running and lobs and dunks.) It also brought the Knicks back to .500, and with a win tonight, they'll be over the mark for the first time since January 12, at 6-5. But that game is against LeBron and the Heat. We wouldn't hold your breath on this one being anything resembling easy. Fortunately, the Knicks just had a night off.